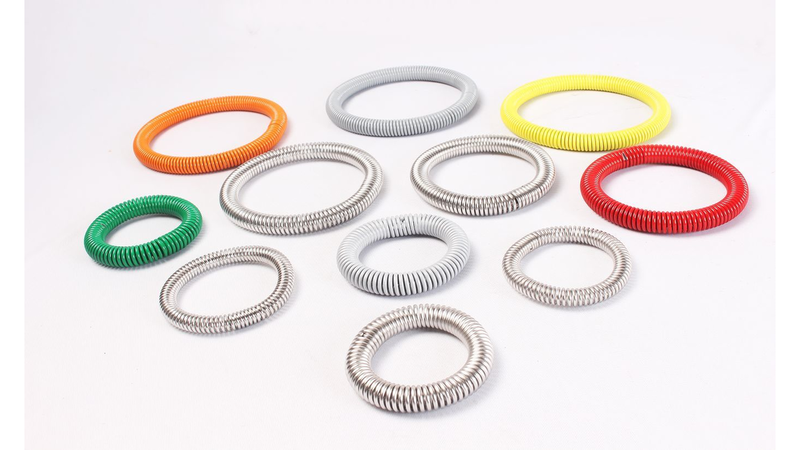 We manufacture Garter Springs from Wire dia 0.5 mm to 3 mm. 1. Half hooks on each end can be hooked together. 2. A small screw can be inserted tightly in one end and the other end of the spring is reverse twisted so it winds itself onto the projecting end of the screw. 3. Several coils on one end can be wound at a reduced diameter. The spring is then reverse twisted and the reduced end is threaded into the other end. A familiar application of a garter spring is for an oil seal used on a shaft .The pressure per linear inch exerted by the spring on the shaft is determined by the amount of contraction exerted by the spring. This is often difficult to calculate precisely due to many variables involved including initial tension, rate, friction, effect of end fasteners, etc.